It is time you got ready to enjoy R&B flashback in a fulfilling way as the talented and energetic Boyz II men take you on a soulful journey with well-composed songs from the past years. 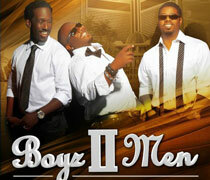 Boyz II Men show in Las Vegas will also bring you sample of new and cool music and a Capella quartet demonstration. As if that is not enough for the night, you will also have the privilege of listening to energetic Motown classics that will give you memories that will last for years. If there is an event that you cannot afford to miss, it should be Boyz II Men show in Las Vegas. It is clear that Boyz II Men have joined the long list of entertainment greats such as Shania Twain, Celine Dion, Tim McGraw, Faith Hill and Guns N’ Roses just to mention a few of them. Instead of spending the weekend bored in home, you can now catch up with their show right in Las Vegas. The four time Grammy award winners will start the show with” Beautiful Woman” together a fully energized band made up of a trumpeter, guitarist, trombonist, drummer as well as saxophonist. To make the event worth attending, the band will perform alongside the group throughout their show. We shall have a smooth transition that will lead into an upbeat Motown segment once they complete some of your favorite songs including “On The bended knee”. Thereafter, the three-man group composed of baritone Shawn Stockman, Nathan Morris and Wanya Morris will exit the stage of the casino as their love for Motown and video reel of their achievements takes the audience in awe across the video display screens. This does not mark the end of their show because they have more than they can give to their fans in Las Vegas. Therefore, do not think of leaving the casino. The trio will have some minutes for a ward change before re-emerging on the beautiful stages ready to take you to another level with more hits. This time round, you will see them clad in Motown classic white and black well polished loafers and dazzling gold coats replacing their opening ensembles of black and sequined- label kind of suits. Before resuming the show, you will listen to brief pre-recorded explanation from each of the three members of the group with explanation about Motown. Afterwards, the trio will pick their microphones to belt out their rendition of “My Girl “. With well-synchronized chorography and vibrancy, the musicians do will do what they always do best to make stand up on your feet to dance as well as song along with them. This can be one of the best moments to teach your spouse one or two R&B dance moves. Without hesitation, every onlooker will join the show as the soul of their beautiful performance resonate in the entire casino as everyone in crowd dances and sings along alongside the stars to a number of Motown favorites such as The Track of Tears among others on endless list. Before you realize that you not in heaven but on earth, the group will take yet another short break so that you can also have a drink as you wait for the next performances. After changing their clothes for the second time, the feeling will become more hometown because this time you will see them dressed in chucks and red sequined, jeans as well as adorned letterman sweaters. This will give you a chance to see how life was like for the group before they had their breakthrough. Just to inform you, Boyz II Men used to perform on subway platforms and streets before they appeared backstage during the Bell Biv DeVoe concert in the year 1989. It was at this point that they impressed Michael Bivins until he agreed to offer them the first big deal. Climax As the show draws to the end, a guitar jam including Stockman, the band’s guitarist will take over the stage before the performance of “ I’ll make love to you” that won them a Grammy Award in the category of the best R&B Duo or Group. The same song also topped the charts for several months. “I’ll make love to you” is one of the songs that almost each of their fans knows the lyrics making it easy to sing along with them. Once the first chord strikes, each of the members of the group will gather stem red roses and several women from the crowd will have hopes of going home with a flower that will remind them about the show. Although this will be the first time to see them interact with the audience, this will not be the only time you will have an opportunity to share something with them. During the show, the group will also engage with its fans on the floor level including selecting women to make some simple moves with them in the middle of the performance. Perhaps, their interaction with their fans is among the reasons that have kept them at the top for all these years in the competitive industry. If you want to shake hands or even have the privilege of getting a hug from the Boyz, you book a ticket on the first row. Most of the time, the trio will exchange smiles and handshakes with their fans while going back upstage to continue with their performance. Concluding their energetic and thrilling show with all the fans standing on their feet, the group will send sincere waves, exchange hugs and handshakes. Up to this point, you will have more reasons to attend more of their shows. In conclusion, if you love R&B music, it is high time you thought about attending Boyz II Men show in Las Vegas. The energetic performance and great love for their fans are among the reasons that have made thousands of people to keep booking tickets to attend their shows in Las Vegas. Apart from dancing and listening to music, you might be lucky to shake hands or even get a hug from any of the members of the group during or after the show.